India's capital is among the most polluted cities in the world, thanks in large part to the growing number of vehicles on its roads. In its just-announced climate change plan, India does not commit to an absolute reduction of its emissions. Instead, it will slow the release of greenhouse gases. The world's third-largest carbon polluter has submitted its long-range plan to curb greenhouse gas admissions in advance of December's Paris climate summit. India does not commit to an absolute reduction in carbon emissions, but does promise to ramp up renewable energy to help slow global warming. In Delhi, the biggest form of pollution comes out of tailpipes. Eight million cars, trucks, buses and three-wheeled motorized rickshaws all belch carbon monoxide, hydrocarbons and dangerous particulates — smog so thick on a winter day that it can block out the sun. The World Health Organization says the air quality in the Indian capital is among the worst in the world. But aspirational India wants cars. 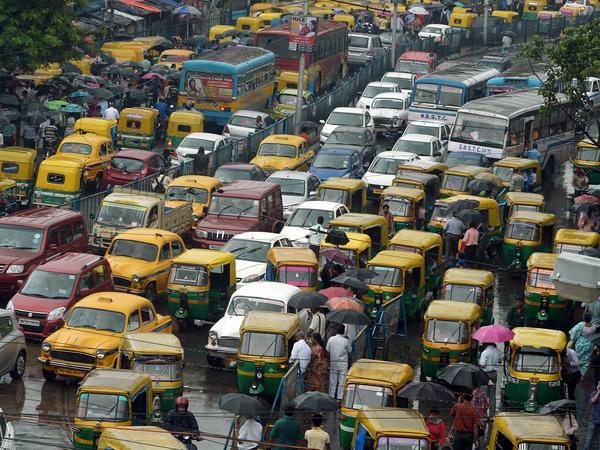 The Delhi-based Centre for Science and Environment says residents are adding 1,400 vehicles a day to the city's already jammed roads. And it's making many people, especially children, sick. A three-year study by a Calcutta-based cancer institute found that nearly half of Delhi's 4.4 million schoolchildren have irreversible lung damage from poisonous air. The WHO says India has 13 of the world's 25 most polluted cities. The country's reliance on coal-burning power plants — and wood-burning stoves for cooking in much of the countryside — is exacerbating the health menace. Yet India is adamant that to pull its 1.2 billion-strong population out of poverty and off the farm, it must transform into a manufacturing hub. Climate change expert Navroz Dubash of New Delhi's Centre for Policy Research says continued pollution is inevitable. "Given the pace at which the Indian economy has to grow if we are to meet the development needs of our people, coal-fired, power-fired power plants will also have to grow," he says. "There is really no way around that for the next 10 to 15 years." For now, India says it's in no position to commit to an absolute reduction of its emissions. Instead, it will slow the release of greenhouse gases. By 2030, India expects its economy to grow seven-fold compared to 2005. Carbon emissions, officials say, will grow only three-fold, as a result of the plan unveiled today. In unveiling India's climate change plan today, Environment Minister Prakash Javadekar stressed the country's ambitious pledge to make renewable energy a cornerstone of its carbon mitigation. "We are raising our non-fossil fuel share of our energy mix by 33 percent," he said. "That's a huge thing. If someone doesn't appreciate, I can't help. Fact remains, we want to walk [a] cleaner energy path." India is banking on solar power playing significant role in its next generation of renewable energy — in ways that could make the country a model for others — for example, in Africa — says social entrepreneur Harish Hande. "Today, even after so many years of independence, we have 300 million people without electricity," he says. "And we can actually leapfrog in many ways and provide energy access through solar, pico-hydro, micro-wind, biogas, a mixture of sustainable technology that's environmentally friendly, socially sustainable and financially sustainable for the countries themselves." Dubash, however, says that India's targets on goals such as renewable energy may be overly optimistic. "The key for civil society in India and for people in the global community," he says, "is to watch the implementation." Historically, India's attitude about climate change has been to put the onus on the wealthy West, saying that its excessive consumption has brought the world to the precipice of global warming. Chandra Bhushan, deputy director general of the Centre for Science and Environment, says India has rightly brought the issue of a less consumer-oriented world view to the fore. "The developed world consumption will not be the benchmark," he says. "If that is the benchmark, then we all should forget about saving the planet." India released its climate plan to coincide with the anniversary of the birth of Mahamata Gandhi — the abstemious spiritual leader who urged the nation he led to independence to reject excess and honor nature. India is the world's third-largest carbon polluter, and it has just submitted its long-range plan to slow greenhouse gas emissions. India was the last major country to do so - the head of the Paris Climate Summit at the end of the year. India did not commit to an absolute reduction in carbon emissions, but it did pledge to ramp up renewable energy to curb global warming. From New Delhi, NPR's Julie McCarthy reports on the country's predicament. JULIE MCCARTHY, BYLINE: Here in Delhi, the biggest form of pollution comes out of tailpipes. 8 million cars, trucks, buses, three-wheeled motorized rickshaws belch carbon monoxide, hydrocarbons and dangerous particulates - smog so thick on a winter day, they can block out the sun. The World Health Organization says the air quality in the Indian capital is among the worst - if not the worst - in the world, but aspirational India wants cars. Residents are adding 1,400 cars a day to Delhi's already jammed roads, and it's making many people - especially children - sick. A three-year study by a Calcutta-based Cancer Institute found that nearly half of the city's 4.5 million schoolchildren have irreversible lung damage from poisonous air. The country's reliance on coal-burning power plants and wood-burning for cooking in much of rural India, are exacerbating the health menace. Yet India is adamant to pull its huge population out of poverty and off the farm. It must transform into a manufacturing hub. Navroz Dubash of the Centre for Policy Research says continued pollution is inevitable. NAVROZ DUBASH: Given the pace at which the Indian economy has to grow if we are to meet the developing needs of our people, coal-fired power plants will also have to grow. There is really no way around that for the next 10 to 15 years. MCCARTHY: For now, India says it's in no position to commit to an absolute reduction of its emissions. Rather, it will slow the release of greenhouse gases. By 2030, India expects its economy to grow sevenfold compared to 2005. Carbon emissions, they say, will grow only threefold. And in unveiling India's climate change plan today, Environment Minister Prakash Javadekar stressed India's ambitious pledge to make renewable energy a cornerstone of its carbon mitigation. PRAKASH JAVADEKAR: We are raising our non-fossil fuel share of our energy mix by 33 percent. That's a huge thing. If somebody doesn't appreciate, I can't help. Fact remains, we want to walk cleaner energy path. MCCARTHY: India is banking on solar playing a significant role in the next generation of renewable energy in ways that could make the country a model for others, says social entrepreneur Harish Hande. HARISH HANDE: Today, even after so many years of independence, we still have 300 million people without electricity. And we can actually leapfrog in many ways and provide energy access through solar, micro-wind, biogas and a mixture of sustainable technology that's environmentally friendly, socially sustainable and financially sustainable for the countries themselves. MCCARTHY: Historically, India's attitude about climate change has been to put the onus on the wealthy West, saying that its excessive consumption has brought the world to the precipice of global warming. India released its climate plan to coincide with the anniversary of the birth of Mahatma Gandhi, the abstemious spiritual leader who urged his nation to reject excess and honor nature. Julie McCarthy, NPR News, New Delhi. Transcript provided by NPR, Copyright NPR.